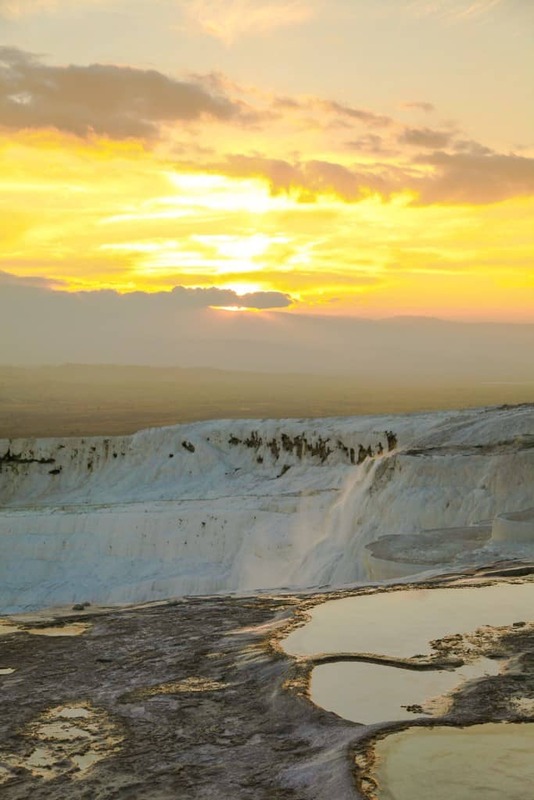 Things to do in Pamukkale: Our Tips for the "Turkey Pools"
Blog Things to do in Pamukkale: Our Tips for the "Turkey Pools"
All those names may ring a bell for they are all used to describe the travertines that make up Pamukkale. The photos are abundant these days and hopping on the Pamukkale bus was no difficult decision, it was an easy must for our tour of Turkey. The Cotton Castle, or Pamukkale as it is more commonly known, is the most visited tourist site in Turkey, outside of Istanbul. We arrived by bus early in the morning and were greeted by a large wall of white. There may not be a plethora of things to do in Pamukkale, but boy is the site overwhelmingly gorgeous. The geothermal waters roll over the cascading travertines giving way to waterfalls that drop dramatically over the cliffs. The site is breathtaking in the early morning, and late hours of the day before the swarms of tourist arrive by tour bus. 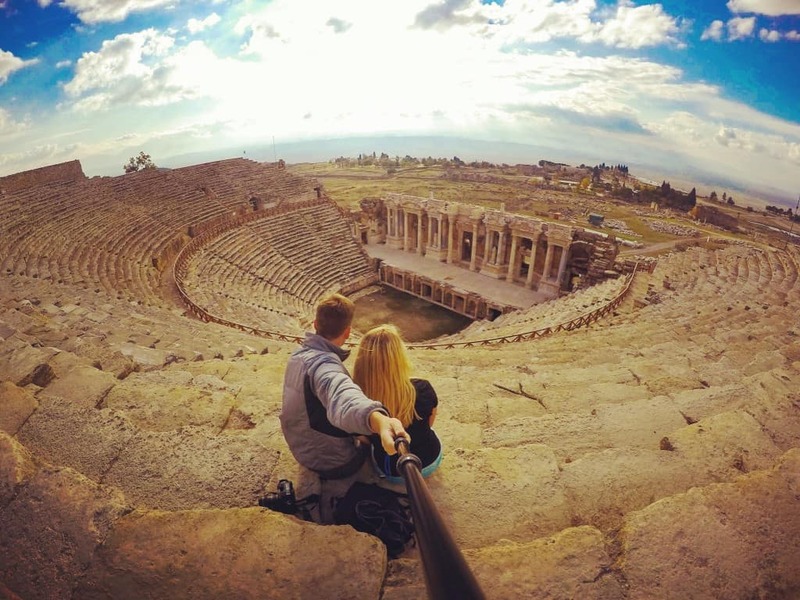 Above the white cliffs lies the ancient city of Hierapolis that has served as a spa destination since the 2nd century B.C. The original spa town was made grand by the Romans. Marc Anthony is said to have gifted a grand bath site here to Cleopatra one that you can still swim in, to this day, the baths are aptly names Cleopatra’s Pools. Pamukkale is a must for anyone visiting Turkey, the site is well worth a trip out to see the ruins of Hierapolis and thermal springs. It has something to offer most of everyone from history buffs to outdoor enthusiasts, to families. Pamukkale like many tourist destinations throughout Turkey is easily accessible by bus too, making it a convenient destination. If time willing you really shouldn’t take a tour. 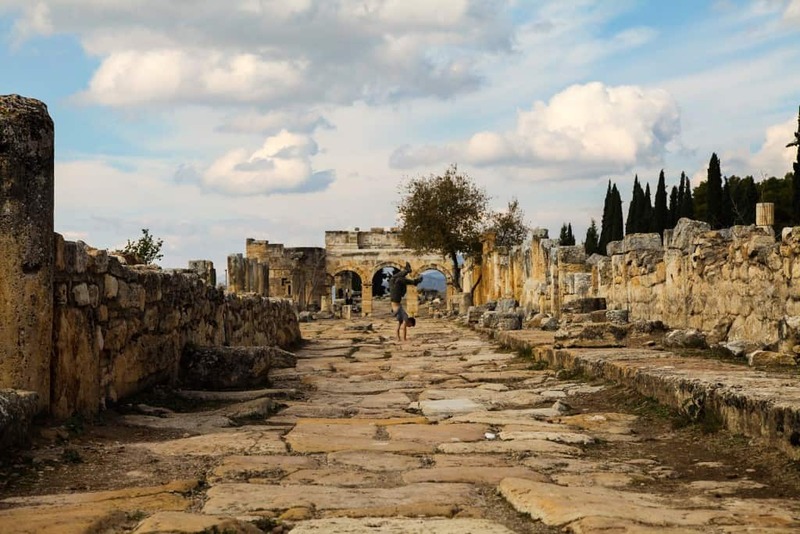 I watched the countless groups get bussed in and then rushed through the Ruins of Hierapolis before clambering down the pools at the same time as the dozens of other tour groups. We choose to do Pamukkale on our own and we’re happier for it. Not taking a tour also saved us some money. You can’t catch photos or enjoy moments like this with a tour group. The city of Pamukkale has a number of options to stay; however, one day is enough. The food options are pretty disappointing; It’s mostly overpriced standard Turkish fare all catering to tourist. The site itself is incredible, but you really need no more than one full day to explore the ruins and enjoy the thermal pools. There are a number of hotels servicing the site giving visitors easy access to the site. Here is where we stayed! The large majority of visitors choose to visit the site with a tour group. These groups arrive around midday and stay until the evening drawing crowds to the site making photos or even enjoyment a difficult task. This is probably the largest argument for doing the site on your own and not a tour. 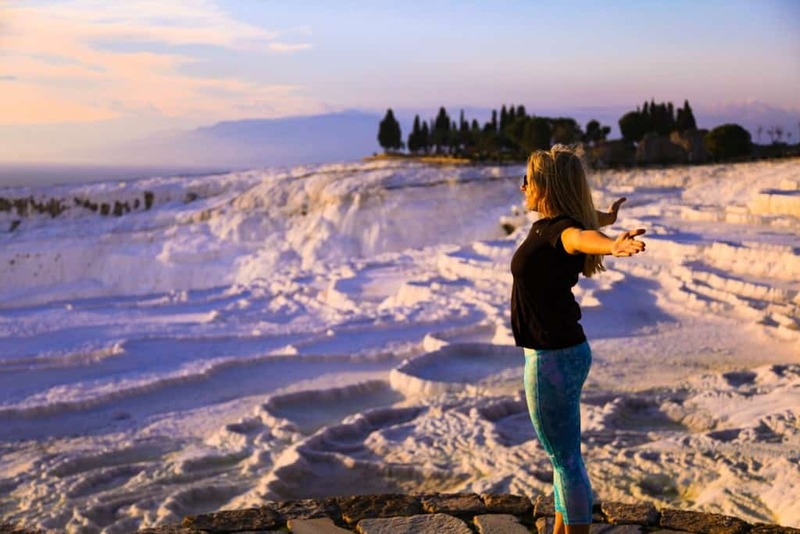 The best way to accomplish this is to stay in the small town of Pamukkale or you can simply take a bus into Denizli stash your luggage at the bus stop (they offer luggage storage) and venture to the town for the day. There may not be as much in the area servicing directly to tourist. However, a Pamukkale bus is no difficulty, thanks to Turkey’s extensive bus system. Most major tour bus companies offer buses from destinations to Denizli. 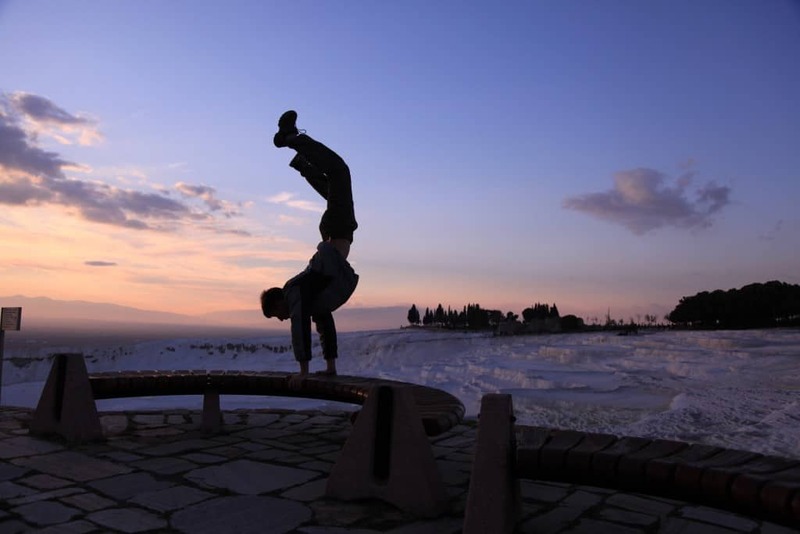 Denizli is the closest city to Pamukkale and can be accessed from numerous destinations around Turkey. We took a bus coming from Konya. From Denizli there are multiple dolmuses running to take you to the small touristic town, the dolmus is not added into the price of your bus ticket and costs about 3TL a person. The bus companies have modern buses with wifi, reclining chairs, TV (Turkish only) and serve coffee or tea (free of charge). Bus companies we recommend are Metro, Kamil Koç, and Pamukkale. Metro and Kamil Koç have websites in English. There are a few things to note when visiting the park. You can not wear shoes on the famous white cliffs so be prepared to be walking up or down the cliffs barefoot. We suggest bringing a bag for your shoes so you don’t have to carry them in your hands. Wear sunscreen. You’re surrounded by reflective white surfaces, meaning lots of sun exposure. Bring a towel. If you plan on taking a dip in Cleopatra’s Pools (not provided with admission charge) or the travertines make sure not to forget a towel. 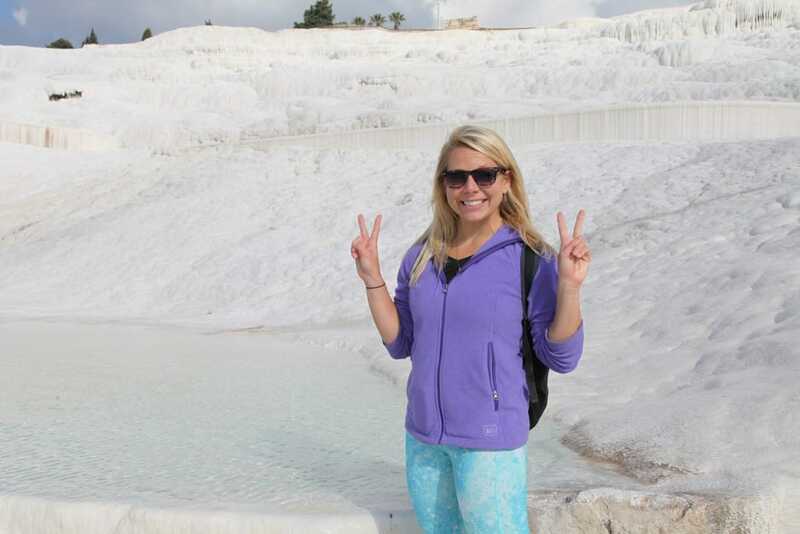 Have you been to Pamukkale? What big destinations lived up to the hype for you? Comment Below.